Casual lifestyle in a trendy restaurant – faucets from Hansgrohe. A relaxed atmosphere and urbane lifestyle combined with Mediterranean specialties and cheerful diners – this innovative concept is in line with current trends. Vapiano has experienced success around the world with its European style and menu, and now plans on conquering the land of the Aztecs. The restaurant has opened in a popular residential quarter in western Mexico City with a stunning view over the metropole. Art galleries, boutiques, embassies and high-class hotels are right on the doorstep. The relaxed hospitality of Vapiano, where pizza and pasta are prepared fresh according to customer wishes, fits perfectly with the precision of the Talis S vanity mixer and its minimalist design. Matteo Thun from Milan is responsible for the design concept in Vapiano restaurants in two dozen countries around the world. Characteristic of his work are the large boards on the wall with the handwritten menu next to the company motto in Italian: “Chi va piano, va sano e va lontano” – People with a relaxed attitude live a long and healthy life! The old olive trees in the restaurant are a symbol of this attitude and also the connection with nature as exhibited by the architect and designer. In each Vapiano restaurant, several old gnarled trees are positioned as an exclusive decoration between the oak tables and lounge area. In Mexico City, the green of the treetops inside is continued outside by a pergola filled with lush plants in front of the restaurant. 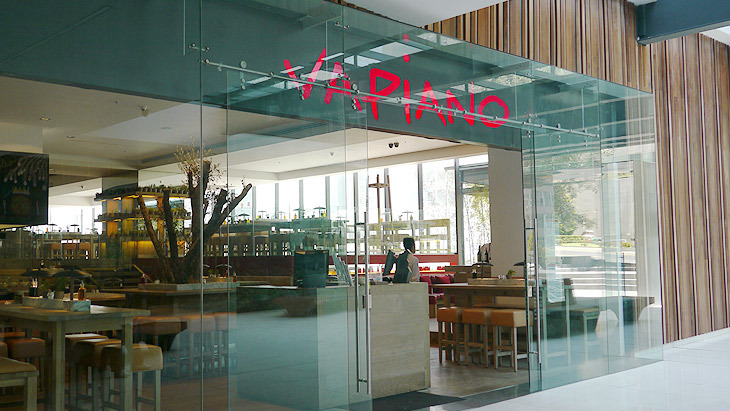 Vapiano has space for 240 guests. The restaurant combines simplicity – guests order their meal via chip card and pay on leaving – with a focus on the customer: Guests watch their meal being prepared in front of them while the chefs take individual requests. The hands-free electronic faucets installed in the Vapiano bathrooms are also designed with the customer in mind. Water is used exactly as needed in the right quantities – and all without wasting a resource that is becoming ever more valuable in the Mexico City region with its approximately 25 million inhabitants.